Ya’ll know this past weekend I went to the SNAP conference in Utah. It was SOoooo much fun! I haven’t recovered yet, I still have jet leg, my suitcase is starring at me waiting to be unpacked, but I had to share one of the fun things I participated in at the conference, called Snap Sisters. The quick version is that you were given an attending blogger to stalk, secretly get the nitty gritty on them, then buy your blogger 3 gifts (much like Secret Santa), on the third gift (1 a day) you were to reveal yourself. My blogger was Kimbo from A Girl and A Glue Gun, she is insanely rad, her blog is super fun to browse through the pages. When I got my hands on the Bold Buzzwords Stamp set from Paper Smooches I knew that it would be a great help at getting my gifts together, and my Xyron adhesive made my projects a breeze! May Arts Ribbon just released tulle in fun colors and I couldn’t wait to try making flowers from it. Attaching the flower to the card was so easy using Xyron 3/8″ Adhesive dots. I love how poofy the tulle flower turned out! I also made a mini set of gift cards. These 3 are made from 1 sheet of 8×11 cardstock. Cut the sheet in thirds, you wil get 3- 3.5″ cards. I couldn’t just stop at cards, so I moved on to coordinating the cards with a fun gift wrapping idea. Xyron double sided 1/2″ Tape is perfect for wrapping gifts so you don’t have visible tape. Doesn’t the black chevron ribbon look sharp against the white paper? Thanks for joining me today for these fun card ideas. 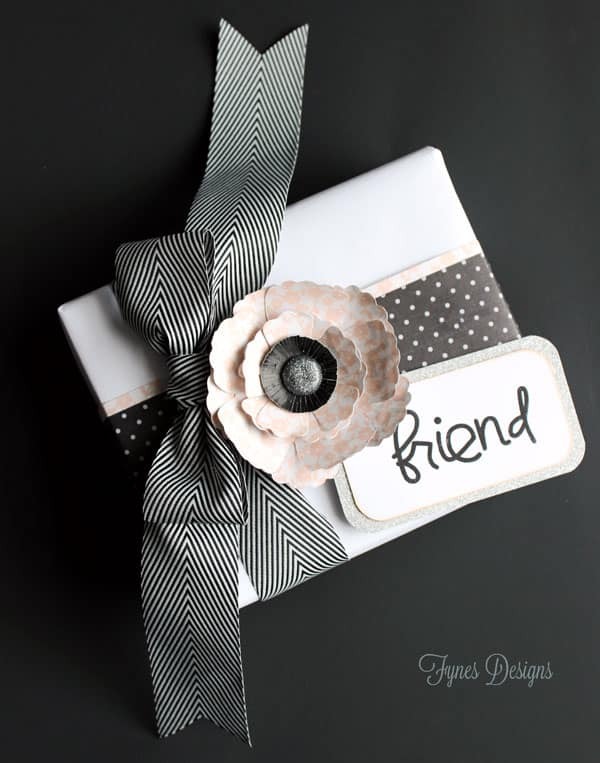 I hope you’ll visit the Xyron blog- Ain’t She Crafty for more Paper Smooches and Xyron inspiration. I love those cute little cards. So simple, but they look great! Very cute cards, Love how elegant the first one is. Great share. Lovely post. I love these cards! I think I might try one for mother’s day! Super cute cards! They would put a smile on anyone’s face, that’s for sure! I was sooooo jealous of your Snap adventures, lived vicariously through you for sure! I’m glad to hear you had such a blast, that’s awesome, on my bucket list for sure. These cards are wonderful, love them. I adore the black Chevron on white paper, adorable! These are so cute!! Pinning this for future reference! These are such cute cards! I made my very first card this past valentines day and I hope to make some more in the future. I’ll definitely keep these ones in mind! !